Technically I am going to be logging in on his Travian account rather than “sitting” for him, since sitters have their own accounts and are authorized in the user settings to have limited access to someone else’s account. Basically as a sitter you can do anything except use “gold,” which is purchased with real money. Alexander commented yesterday that he had been raided by some players who are active at night when he is asleep, and he suspects they live in Australia or elsewhere “on the other side of the world.” That was the case when we played Travian together last Spring. It was advantageous to have “sitters” who were in Australia or New Zealand, since they could be active on your account during the night when you’re sleeping. It is going to be fun to “sit” for Alexander next week, but I’m sure I’ll waste a fair bit of time taking care of his Travian village as well. Travian is an award-winning German massively multiplayer online browser-based strategy game developed by Travian Games GmbH. The game’s developers drew roughly from Classical antiquity and particularly from the Roman Empire to create a predominantly militaristic real-time strategy. Along with three English versions, and the original German version, the game has been translated into over 40 other languages, and has over 3 million players and over 250 servers worldwide. In 2006, it won the Superbrowsergame Award, in the large games category. Travian is programmed in PHP and runs in most modern browsers (such as Camino, Firefox, Internet Explorer or Safari). Travian was also the first game of its type to be playable on mobile phones. When played on a mobile phone, it uses Java. 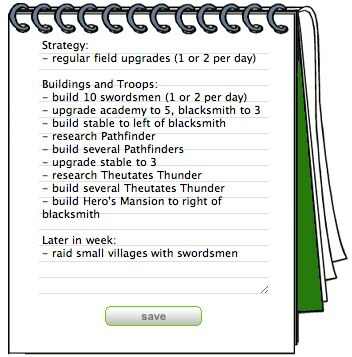 Alexander would likely point out that the game can also be played on the iPhone’s Safari web browser, as he frequently borrows my phone when we’re out / away from home and he wants to do some field upgrades, build a new building, or train some new Travian troops. The real-time aspect of the game makes it both time consuming and rather addicting. I find it amazing my son is engaged in a role playing game that will probably last six months, with people all over the world who he will never meet but who share a similar passion as he does for games like this. As I noted in January 2008, Travian does provide excellent opportunities to learn about Internet safety, and I’m sure we’ll have some more interesting conversations along those lines in the weeks and months ahead. I love your blog generally, Wes, but how about a piece on Internet addiction? You always focus on the positive aspects of technology in education, but to be balanced there are negatives that need to be addressed also. Anytime that someone can’t leave something alone for a week while they go have fun in a natural setting, for whatever reason, suggests addiction may be present, no? Good topic suggestion, Mark. I’ll be glad to take that up in an upcoming post. I’ve written about that theme in the context of “digital discipline” in the past, and have that as one of my blog categories in fact. My April 2007 post, “Need for digital discipline in SL and RL,” addresses some aspects of Internet addiction but this clearly can and should be revisited further and more often. I’m planning to co-teach a weekly class at our church this fall which will be titled something like, “Digital Dialog: Understanding and Leveraging the Constructive Value of Technology in our Lives and Homes” and that will be a topic we’ll discuss. Having ready access to laptops for our kids, this is something we face constantly. We should NOT be “on screens” all the time, yet without directions and boundaries sometimes I think my kids would be. The game Travian actually requires that if you are playing and go inactive for a period of time, you get a “sitter” to play your account. Your account status shows if you’ve been inactive for more than 24 hours. You are blue if you’re online now, green if you’ve been online recently, yellow if it has been a long time, and red if it has been a REAL long time. I’m not exactly sure what those times are, but basically the game encourages you to be online at some point each day, the more the better. People who go red “get farmed” which means other people attack their village and raid/take their resources. So the game itself definitely encourages Internet addiction. That is a big reason I am NOT playing anymore myself. The Travian World Analyzer site is used by players to identify other players who are inactive and therefore good targets to attack as “farms.” It is an interesting example of how to use realtime data to accomplish goals and objectives.